Custom print your logo and company info on this best selling popular tape measure. Lightweight, portable, promotional tape measure comes with a pen, pad and a built-in level to make your life easier. Great for contractors, construction workers and do-it-yourselfers. Charcoal Imprint Area: 1-1/4" x 1-1/4"
* 10' tape measure with metric and inch measurements. The tape measure is one of the most common tools in a homeowner's arsenal; in fact it is so common that most people take it for granted. 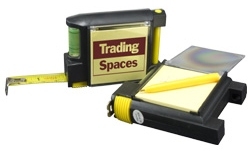 Many people do not even think of their promotional tape measure as a tool. But, the reality is there are not many projects that do not require accurate measuring and marking. A good printed tape measure in the hands of someone who knows how to get the most out of it ensures that a project gets off to a good start. This is a popular, best selling promotional product - tape measures with class. This product will forever imprint your name brand into their mind for the years to come. Great gift for customers and loyal employees.